Sheds World may have only been in business since 2008 and they may even order most of their products from other garden retailers, but the fact remains many, many people have jumped on board the Sheds World train the last few years. They claim that over 45 million visitors checked out their site last year. That is just an incredible number and the reason for this is the sheer amount of different products that Sheds World offer. They have a great variety of wooden, plastic and metal sheds, but as well as this they do also have other garden structures such as summerhouses, playhouses and log cabins. In our Sheds World review we did point out some things that made us raise our eyebrows, but we cannot ignore the vast amount of you who look at their site. The fact so many people look at their site means that many sites are offering these Sheds World voucher codes that they claim will save you money. Well, Sheds World do not actually stock a lot of their products themselves. They actually order from other retailers, so it is very unlikely that they would be able to offer a discount code that will cut their profit. Well before we tell you about the sites that will waste your time with Sheds World vouchers that are not what they seem, we have for you a few ways that you can ensure you are getting the best Sheds World deal possible. The 5 tips that 90% of people who SAVE money at Sheds World use! What we have here for you are the proven ways to make sure your money is going as far as it possibly can when dealing with Sheds World. We know that in many cases, garden retailers do not make a ton of profit on sheds, that is why we always are suspicious of these Sheds World coupons that claim to save you money. Here though we have the tried and tested ways that you really can get the most out of your money when you buy something from Sheds World. Before we start the list we do want to take a moment to tell you that if you buy in bulk then you can get some great savings here. So if you are a business or you just want to have a ton of sheds in your garden and rule your own shed kingdom, be sure to see what kind of deal they will give you for ordering in bulk. See What Their Current Top Offers Are: Sheds World have a very easy to find section on their site where they have what they consider to be their best offers. Best of all there is no Sheds World voucher code needed to save money here. They just have a very varied selection of products. There really is no rhyme or reason as to what is going to be in their top offers section. For example as of right now they have sheds, tool stores, playhouses and even general storage boxes. The fact that there are so many different things in here makes this a top offers section that we really like. It is worth noting that this is a part of the site that does change regularly, so what they have classed as a top offer this week may change next week. So if there is nothing that catches your fancy right away, then check back a week or two later to see if there are some new offers that interest you. Treat Your Winchester Shed, Playhouse or Summerhouse For A Penny: Now this is an offer that we really, really like. The majority of wooden sheds, playhouses and summerhouses will require wood treatment, but if you were to purchase a Winchester brand one then you would be able to add a large tub of treatment for only a penny. We love this Sheds World deal and the fact that you do not have to faff around with some kind of Sheds World discount code makes it even better. This is a deal that is shown right in the middle of their homepage, so it is very easy to find. This may only be a timed offer, but they have had offers on treatment in the past, so offering free or severely discounted treatment seems to be a thing that Sheds World really like to do. Make Sure You Are Up To Date With Their Offers: Normally we would tell you to not give a site your email address, especially those offering these magic Sheds World coupons that are going to save you a fortune. But, Sheds World do actually have their own official newsletter that they say will keep you up to date with all their latest offers. Now to find this you will have to scroll all the way to the bottom of the homepage, but this is something that is very easy to do. And actually this is something we recommend if you want to keep on top of the latest Sheds World deals. Free Delivery On £300 And Over Products: Perhaps the most common Sheds World voucher code that you will come across is one offering free delivery when you spend over £300. Well we can tell you right now that this is actually something that they do offer as standard on their site so there is no need to sign up to some other site or use some kind of Sheds World discount code to get this offer. 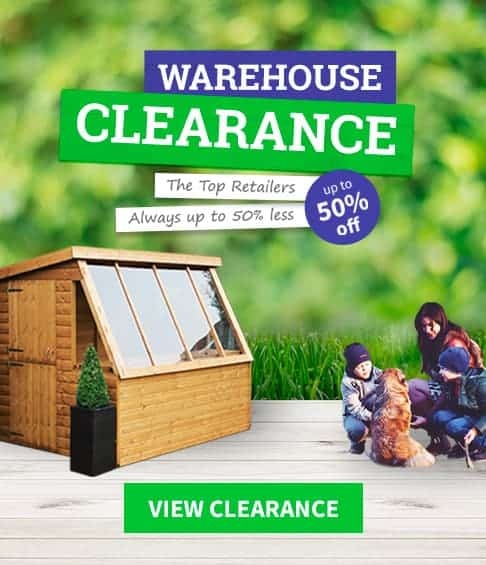 Interestingly, they say that this offer is for all items so no matter if it is a shed, playhouse or even a large summerhouse, as long as it is over £300 then you will be eligible for free delivery. Check The Sheds World Twitter Page For Up To Date Deals: Once you have finished stalking your favourite celebrity, you can have a look at the official Twitter page for Sheds World. This is a pretty standard Twitter page to be honest, but we did notice that they do like to keep people up to date with the latest Sheds World deals and offers. You do not even have to follow them to see what they have to say. You can just jump on Twitter and have a look at their page to see if they have any special offers going on at the moment. A round-up of all the current Sheds World voucher codes we found online. As well as making sure that you are well informed about that solid storage shed you like the look of or that glorious summerhouse you want to spend your evenings in before you buy it, we also like to make sure that you are getting the best deal possible. Getting the best deal possible though does not mean wasting your time looking around for the best Sheds World voucher codes, as most of the time these offer nothing that you could not have gotten by just going direct to Sheds World. In most cases you will just waste about half an hour of your time and be no better off for it. Well we do not want that to happen to you as that half hour would be better spent having a cup of tea while watching videos of people doing stupid things on YouTube. We had a really good look around to see what sites are claiming to offer these type of Sheds World coupons and deals and below we have listed the sites that are going to do nothing more than just waste your time and probably make you a little bit angry in the process. We used the most common search terms for Sheds World which are: Sheds World Voucher Codes, Sheds World Coupon code, Sheds World Current Discounts, Sheds World Current Voucher Codes and Sheds World Sale. Beware Of Old Codes! One thing we want to warn you about before we get into the actual sites is Sheds World voucher codes that have expired. Some sites like to keep expired codes around as it makes their selection of Sheds World deals and offers look more impressive. Be sure to keep an eye out for these old codes as they are the ultimate waste of time when it comes to saving money. What they claim? When you first go to PromotionalCodes.org.uk you are greeted by a very friendly site. They give you a little bit of background information about Sheds World and then they tell you how to use their Sheds World voucher codes. They do not have expired codes here and they do make a point to mention that these are current Sheds World deals. What We Found? This is certainly one of the more friendly sites we have looked at, but at the end of the day when we clicked on their Sheds World deals, such as the one saying you can get as much as 50% at Sheds World, we were just taken to the Sheds World homepage. This is the case for most of the things that they list on their site. You are literally getting nothing here that you cannot get directly from Sheds World. You will not save a single penny by coming here before you go to Sheds World. What they claim? One thing that MyVoucherCodes.co.uk do is make sure that the Sheds World vouchers they have are up to date. They make a point to mention that the codes they do have are for 2016, but they have an expired codes section at the bottom of their page and while this is something we do not like to see, at least they have put their old codes out of the way. What We Found? This is a site that while not offering anything of any kind of substance does at least make sure to have the current deals that are being offered at Sheds World. They do not have a vast amount of offers here, so while you are wasting your time coming here at least they are not making you go through a ton of old and expired codes. Still while these deals may be current, you can just get them by ignoring this site and going to Sheds World direct. Also, while it may be a little on the tempting side, please do not try and use their old codes as they will not give you any savings. What they claim? The first thing that Revouchers.com are claiming is that they have valid discount and promo codes for Sheds World. They specifically mention the current month so that you think you are getting Sheds World’s deals that are bang up to date. They also claim that their Sheds World voucher codes have a high percentage success rate, which is a pretty bold statement. What We Found? The reason that we say it is a bold statement is because they really are not offering anything here. What they have are just links to the Sheds World sites that really will not save you any extra money at all. They also have these weird deals such as the wonderfully worded, Save Metal Sheds Starting At £94.99. Are you responsible for saving these sheds from some kind of evil mastermind? When you click on this you are taken to a general area of the Sheds World site and not one that is about metal sheds. It is just a huge waste of your time! VoucherSlug.co.uk – Has a Facebook offer that does not exist! What they claim? VoucherSlug.co.uk are proud to bring to you Sheds World vouchers. But not just any Sheds World vouchers. The ones that they have are as they put it active promo codes that are updated daily! If that is in fact true, then in theory this would be the ultimate site to come to in order to get the best Sheds World deals. But as you have probably guessed, that is not the case at all. What We Found? Okay, the first thing that caught our eye here was that they have this deal where they claim if you like them on Facebook you can save money. Well, first of all they do not specify if you have to like VoucherSlug or Sheds World, and also there is nothing about this at all anywhere on Sheds World! Also the “deals” that they are offering are just what you get on the Sheds World homepage. Also they try to get you to look at vouchers for other sites that have nothing to do with Sheds World at all which is a major annoyances of ours. What they claim? We are sure that many people in the UK have heard of MoneySuperMarket.com and many people actually have saved money by using this site. But when it comes to offering Sheds World discount vouchers they really are one of the worst as they are offering absolutely nothing! What We Found? Now you may wonder why we have put them on this list if their Sheds World deals section is empty. But incredibly despite not having one single Sheds World discount code, MoneySuperMarket.com are one of the first five sites that come up when you search on Google for ways to save money with Sheds World. There is nothing here, so please do not bother checking it out. What they claim? PromoVouchers.co.uk claim to work 24 hours a day to make sure that their Sheds World page is bang up to date. And to be fair to them, they do actually have the same Sheds World deals that most of the other sites that are listed on this list have. Of course that does not make them great, and we will tell you right now that coming here is not going to result in you saving any kind of money. What We Found? First of all, there are not actually any kind of Sheds World voucher codes listed on this site. What they do have are various deals that are going on at Sheds World right now. Many of these are just links to the Sheds World homepage and they do not even take you to what they say these deals they are promoting are for. For example, one of their deals is for metal sheds, but when you click on it, you do not get taken to the metal sheds section of the Sheds World site. Meaning you will still have to search to find what you want. This makes coming to PromoVouchers.co.uk a waste of your time. They also have a section of “things you might like”, where there are codes for random items ranging from shoes to holidays. MinistryOfDeals.com – They have deals that just do not exist! What they claim? MinistryOfDeals.com is one of the more boastful sites we have come across. They say that they list only the best Sheds World voucher codes, even claiming that they will save you as much as 50% on certain products. In what world is a shed retailer ever going to give sell you a shed at half price? Anyway, this is a site that tries to really dazzle you and impress you with the amount of Sheds World promo codes they have. What We Found? Every single Sheds World deal we clicked on here took us to the homepage! Worst of all, some of these deals are just blatantly bogus such as the one that somehow claims will save you 15% on all purchases! We really cannot get over how bad the supposed deals being offered by this site are, and unfortunately we know that some people are going to feel like they have found gold when they come to this site. We can assure you though that you will not save anything by coming to MinistryOfDeals.com before you go to Sheds World. Also, they sneak in deals for other sites just below their Sheds World deals, so it would be very easy for someone to click on something totally unrelated. Avoid at all costs! What they claim? NetVoucherCodes.co.uk at a glance is a harmless site that is not really bragging about being the most awesome site when it comes to Sheds World voucher codes. But they do claim to have codes that are from 2016. Interestingly, none of their offers are actual codes, but they are just deals. What We Found? We found that you really are not getting any kind of deal at all when you come here. They have two prominent Sheds World deals listed and they both are not going to save you a single penny when you click on them. The first one tells you that you can get summerhouses for a specific price. Well this is not a special deal at all, it is just what Sheds World are selling their summerhouses for. They also have a similar “deal”, but with log cabins. This is the kind of site that we feel is just a waste of your time and we also would not recommend signing up for their newsletter like they want you to do. What they claim? The people at CouponsCodes2Save.com claim to have only the most popular Sheds World coupons on their site. Wow, that is a load off our mind as we were getting real tired of looking at all the unpopular ones. They do not have a lot of Sheds World deals here, instead they have focused on what they clearly feel are the best Sheds World discount codes that are out there. What We Found? We found an amazing deal that will give you up to 50% off! But like the other sites that offer this too good to be true Sheds World deal, you will just be taken to the homepage of Sheds World when you click on this epic deal. None of the deals that they have listed here are going to save you any money. They even have a section of deals for other sites which is even larger than their Sheds World section and as we are sure you have realised by now, is something we really do not like at all. What they claim? VoucherAndDiscountCodes.co.uk is a site that does actually have a Sheds World voucher and discount codes section. In this section they do claim to have active codes that are going to get you a deal from Sheds World. They specifically mention 2016, so they are trying to be up to date. What We Found? We found one Sheds World deal here. That is right just one, but to be fair to this site they at least have made sure it is a deal that is actually valid. Now this deal is not exclusive to this site and by clicking it, you will be just taken to the Sheds World homepage. But at least they are not trying to impress you with a bunch of fake codes. The eye opening thing about this site is that they do actually have more Sheds World voucher codes that are expired than they do deals which are current. Other sites have done this, but what really annoys us about the expired codes section here, is that they say that they might still work or sometimes they will start working again. No they will not! These are Sheds World vouchers that are no longer valid, so do not waste your time trying to get lucky.